Added by Indo American News on February 21, 2013. SAN FRANCISCO: In the city by the Bay, the thing that’s certain is that the population diversity has created a remarkable mix of people which is skewed towards Asians in general, but not Asian Indians per se, as they constitute but a small percentage of the melting pot. The 80-X bus that goes crosstown from Fisherman’s Wharf south towards Market Street fills up with middle-aged Chinese, mostly women, who have done their grocery shopping, and talk loudly in Cantonese or Mandarin as they vie for seats in the standing room only bus. A few older men and some high-school and college students get on in Chinatown. The pre-recorded bus stop alerts are in Chinese, Spanish and English. Only a couple of Indians – yours truly included – rode it and there wasn’t in sight! Even though they aren’t as visible in the central district (although further south, in Silicon Valley, they make up a majority), desis have made up for it with many restaurants like New Delhi, India House and a few more in the Tenderloin District by the Powell Muni Station, competing against the Chinese, Vietnamese, Thai and Japanese sushi places. But where they shine the most – and you could say that literally – is on the small tube, every night on the evening news. 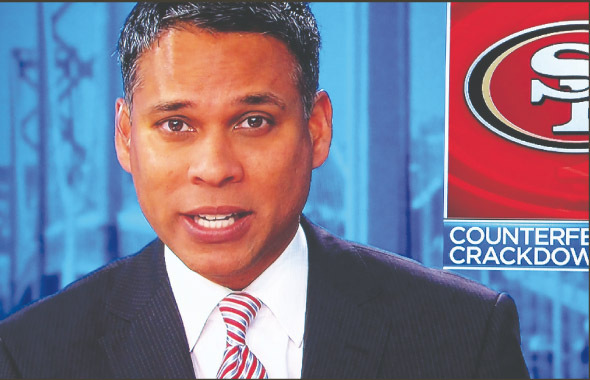 On NBC Bay Area, the handsome Raj Mathai is the co-anchor every night at 5pm, 6pm and 11pm. Raj is an award winning television journalist and has even reported from the Olympics in Salt Lake City, Athen, Turin and Vancouver. Born in Trivandrum, India, he grew up on the Bay Area Peninsula, graduated from Los Altos High School, and graduated from San Diego State University. Raj was the country’s first sportscaster of Indian descent. 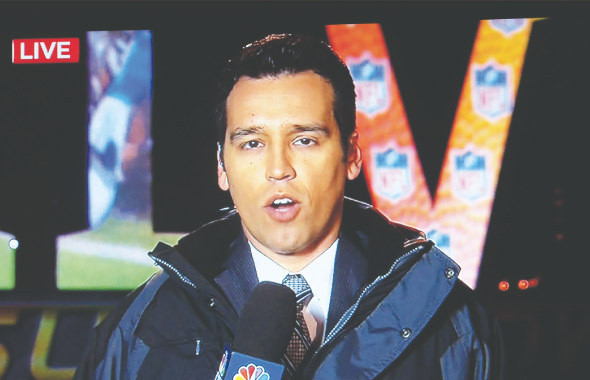 Raj is often joined on screen by Ahmed Fareed, a studio host and reporter for American TV channel Comcast SportsNet Bay Area, who just covered the Super Bowl. Fareed is a native of Sparta, Michigan, where he played quarterback for the Spartans. He is a graduate of Syracuse University S. I. Newhouse School of Public Communications with a degree in Broadcast Journalism. And not to be outdone or pushed aside, Indian women have made their mark too in a field that is outside the normal that you’d expect for TV journalism: metrology. 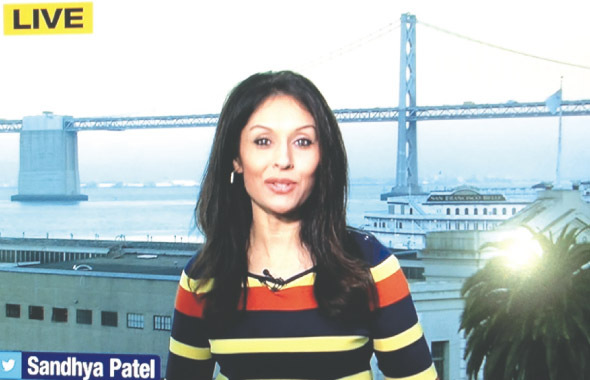 The pretty, young and petite Sandhya Patel takes care of the weather forecasting on ABC 7 News and is the weekday anchor at 5 and 11pm. She grew up in San Francisco and Monterrey Bay and turned to the weather center in 1993. Sandhya is married and a mother of three, a girl and fraternal twins. Of course Houston, has its own crops of desi television journalists and print journalists. It’s nice to see the cultural and racial pool spread all over the country even as many of us have made our mark in other areas of public service.